Captain Kelly Brown believes Scotland can finally deliver a victory in the autumn Tests on Saturday after defeats by the All Blacks and South Africa. The Scots take on Tonga at Pittodrie desperate for a morale-boosting win. 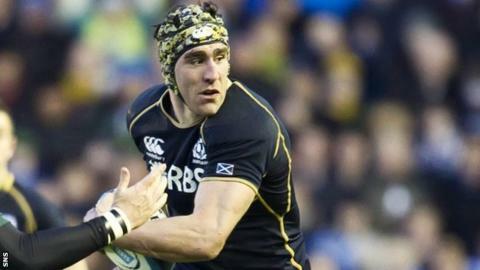 "We've looked at the last two matches and we know that when we get things right we can be very dangerous," the flanker told BBC Scotland. "It's just about really nailing an 80-minute performance. We cannot wait to get out there on Saturday." Brown described the role of the Scotland fans in the north-east of the country as "absolutely massive". The Saracens player said: "The crowd at Murrayfield in the past two weeks have been very vocal and I am sure the Aberdeen crowd will take that as a challenge and make a lot of noise on Saturday." Throughout the side they have guys who have that little bit of magic so we really need to be as sharp as we can and impose our game on them. "We're in a really good place and we know to expect an incredibly physical challenge but it's one I am very confident that as a squad we are capable of. "First and foremost it's just about winning. We are looking forward to it. "Over the last three weeks we have learned a lot of lessons. We have some guys who are new into the squad and the systems but they have settled well. "I am sure that we will go out there all guns blazing on Saturday." Tonga are 12th in the IRB rankings, two behind Andy Robinson's team, and will present formidable opposition. "They are the sort of side who have huge physicality, really big strong men, so we have to match that," continued the Scotland skipper. "Throughout the side they have guys who have that little bit of magic so we really need to be as sharp as we can and impose our game on them." Glasgow Warriors' scrum-half Henry Pyrgos will make his first Test start after an impressive contribution as a substitute against the Springboks. "Against South Africa he came off the bench and added a lot of energy and scored the try," said Brown. "There is no doubt that he has worked incredibly hard and deserves it."